Winter is tossed aside as the temperatures rise, the flowers bloom and the Easter Bunny hops to the beach for the greatest events found off the coast of North Carolina. Hunt for more than 2000 plastic eggs and smile as you get your picture taken with the Easter Bunny at The Easter Eggstravaganza taking place at Jockey&apos;s Ridge Crossing Shopping Center. Or, venture across the street to see animal kites over 50 inches in size soar through clear blue skies at The Kite Festival. There are many things to do on our coast during the spring season, so bunny-hop over to The Outer Banks for an Easter vacation you and your family will remember for a lifetime. Everyone has a story to tell. 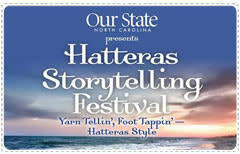 That's why we're inviting you to the first-ever Hatteras Storytelling Festival this May. Held in the southernmost community of the island, Hatteras Village, dance to live music, eat local food and hear many famed historians and authors tell their tall tales. And don't miss Connie Regan-Blake, one of the most celebrated storytellers in America. And don't miss Connie Regan-Blake, one of the most celebrated storytellers in America.